Menulog delivers for Charcoal Pit so you'll be able to track your courier on a map. Choice of lamb, pork, chicken or combo with lettuce, tomato, onion and garlic sauce. Served with a cup of chips. 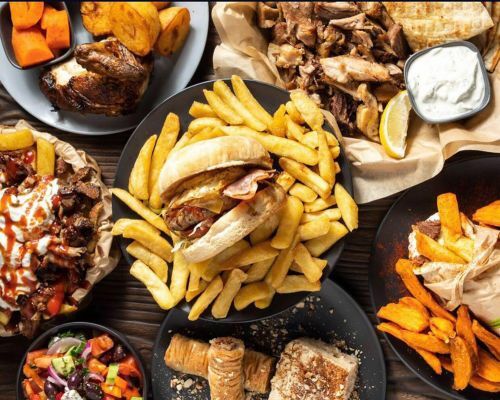 Choice of lamb, pork, chicken or combo with Greek salad, chips, garlic sauce and pita bread. Choice of lamb, pork, chicken or combo with chips, garlic sauce, tomato sauce and BBQ sauce. Choice of lamb, pork, chicken or combo with tomato, onion, garlic sauce, paprika and chips inside. Choice of lamb, pork, chicken or combo with medium Greek salad, two pita bread, chips and garlic sauce. Pita, falafel, lettuce, tomato and garlic sauce served with a cup of chips. Salt and pepper calamari, pita, lettuce, tomato, onion and garlic sauce served with a cup of chips. Pack of your choice of meat cooked on charcoal at the pit. Feeds 2. Served with peas, carrots, gravy and choice of spuds or chips. Served with coleslaw, Greek salad and choice of spuds or chips. Chicken cut in one-eighth, medium Greek salad, large chips, small gravy and a 1.25L pepsi. Cooked to perfection on charcoal. One piece of butterfish, two prawns, two calamari and two scallops served with chips and tartare. Four butterfish, medium chips, medium Greek salad, tartare and 1.25L pepsi. Six crumbed calamari served with chips tartare and lemon. One butterfish, chips served with your choice of two salads, tartare and lemon. Six crumbed prawns served with chips, tartare and lemon. Two butterfish served with chips, tartare and lemon. Two butterfish, chips served with your choice of two salads, tartare and lemon. One butterfish served with chips, tartare sauce and lemon. Lettuce, tomato, cheese and sauce. Served with a cup of chips. Cheese, bacon, onion, egg, pineapple, beetroot, tomato, lettuce and sauce. Served with a cup of chips. Lettuce, tomato, cheese and mayonnaise. Served with a cup of chips. Cheese, bacon, onion, egg, pineapple, beetroot, tomato, lettuce and mayonnaise. Served with a cup of chips. Double cheese, double bacon, onion rings and BBQ sauce. Served with a cup of chips. Pita bread, beef sausage, cheese, onion and garlic sauce. Served with a cup of chips. Homemade beef pattie, lettuce, tomato, jalapenos, cheese, ranch sauce, BBQ sauce, bacon, egg and onion rings served with a cup of chips. Thinly sliced scotch steak, lettuce, tomato, beetroot, onion, cheese, sauce, bacon, egg and pineapple served with a cup of chips. Bacon and egg on a bun with tomato sauce. Falafel, tomato, lettuce and mayonnaise on a bun served with a cup of chips. Hotdog with butter and sauce served with a cup of chips. Veal served with chips, peas, carrots and gravy. Chicken served with chips, peas, carrots and gravy.